The world’s youngest style icon, baby Prince George, will make his next public appearance when he’s christened at St. James’s Palace on Wednesday. 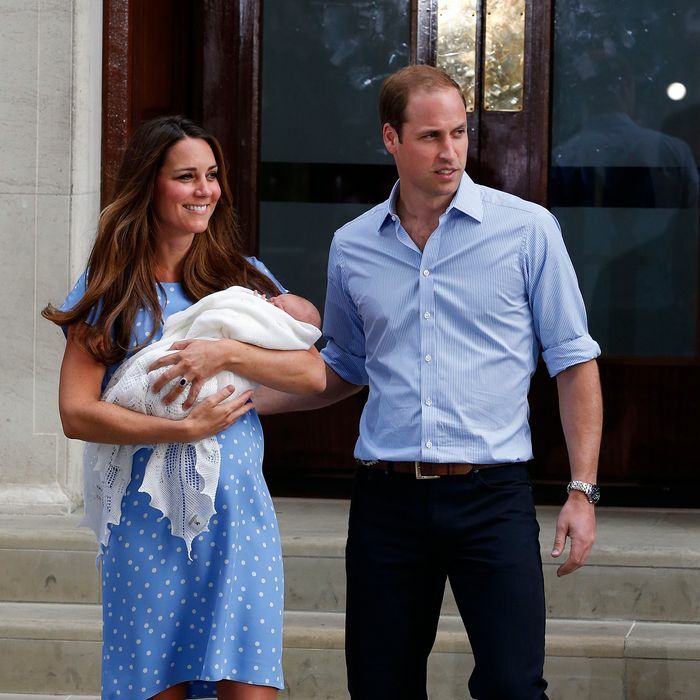 But this time he won’t be bolstering the swaddling-blanket economy; instead, he’ll wear a custom-made christening robe by the Queen’s couturier, Angela Kelly. The historic royal christening gown, which has clothed 60 royal babies since it was created in 1841 (including Prince George’s father, William), is apparently too old and fragile for another dunk in the Palace’s holy water. It was last worn by Lady Louise Windsor, daughter of the Earl and Countess of Wessex, for her christening in 2004, and has since been permanently retired. Indeed, Prince George won’t be the first to wear Kelly’s replica, which was created in 2008 for the christening of James, Lady Louise’s younger brother. Both the old and new versions are made of white silk, with cap sleeves and a Honiton cotton lace overlay, created to resemble the dress that Queen Victoria wore in her wedding to Prince Albert in 1840. But enough about that: What’s Kate going to wear?